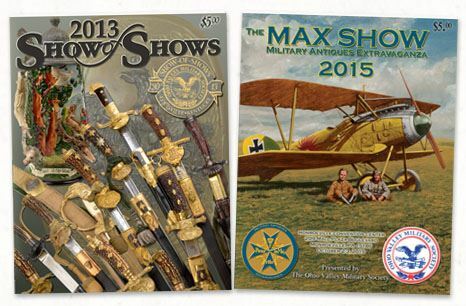 If you are involved in the hobby of collecting antique militaria either as a collector, dealer, or both, advertising with the OVMS in our show programs is a great way to get your name or business in front of a significant portion of the collecting community. Better yet, this is one of the best ways to get serious mileage out of your advertisement. Collectors and dealers who attend the Show-of-Shows and MAX hang on to their programs, and keep them handy to use for years to come. You can place ads in the program running from business card size all the way up to full-page glossy color. CLICK HERE for our current rates. Ad copy should be 'camera ready' - 300dpi resolution, in CMYK color mode.